Map and Power Point images courtesy of the City of Long Beach. 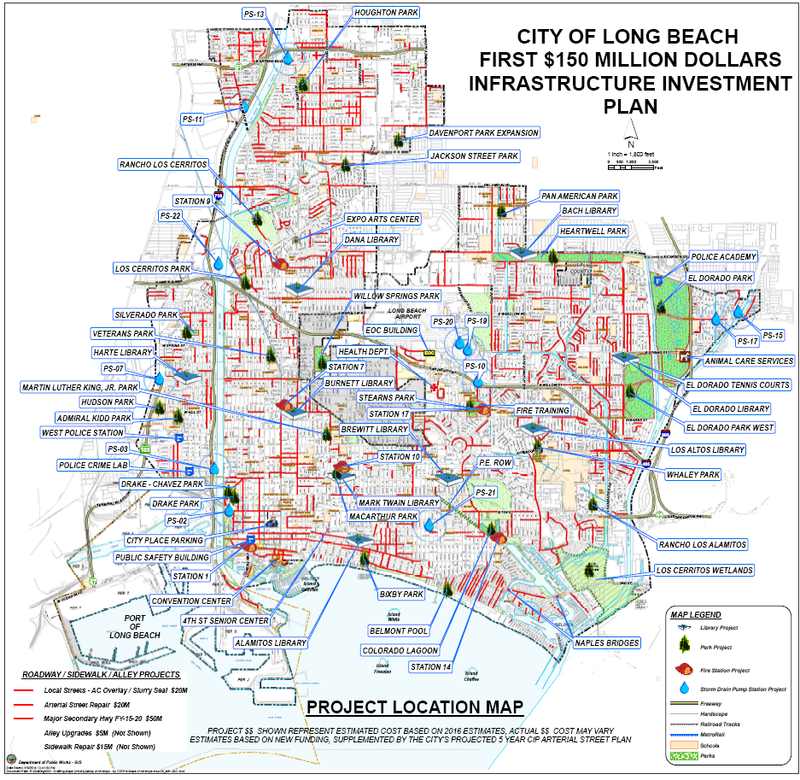 On Tuesday evening during a Long Beach City Council study session, city staff presented a $150 million infrastructure investment plan to council members that seeks to address community concerns regarding the specific use of current funds and the potential revenue stream generated by proposed sales tax measure, Measure A. Speaking to members of the press in a closed-door conference Tuesday afternoon, Long Beach Mayor Robert Garcia and City Manager Pat West outlined the use of funds, emphasizing that infrastructure investments with new funding would be prioritized based on need and spread across the entire city. He stressed the plan is contingent upon the city receiving a large, immediate investment, like that of Measure A. If no such funding stream becomes available, the specified changes to city spending would not occur. However, the plan is general enough that room remains to incorporate other funding streams aside from Measure A, shifting the actual dollar amount required of the city for investment. Such priorities range from street, sidewalk and alley repairs to library, police and fire improvements. The plan created would take an estimated three years to complete in full. “It’s really about upgrading our facilities to meet 21st Century police and firefighter [standards],” said Garcia. He said the priorities in this particular infrastructure investment plan were partially based on the city’s existing pavement management plan, which is completed by the Department of Public Works (DPW) at regular intervals. 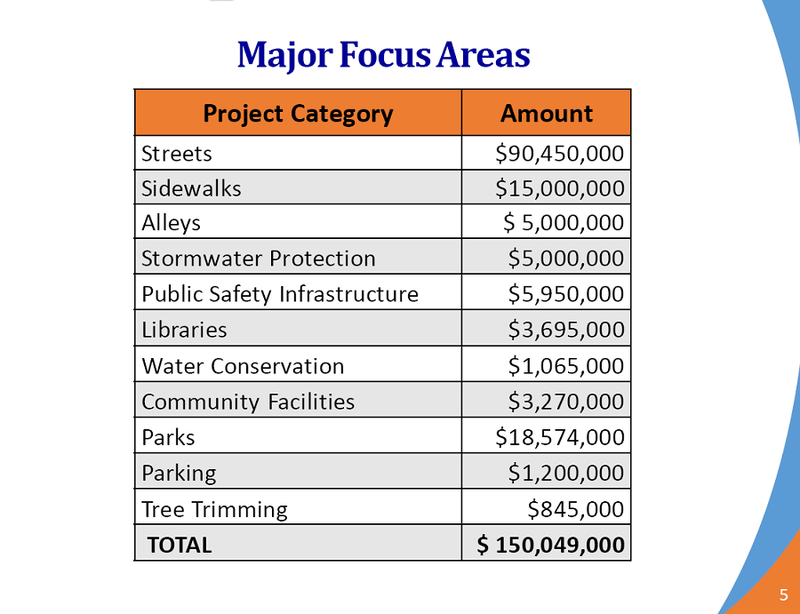 The plan allocates $90.45 million for streets, $15 million for sidewalks and $5 million for alleys. Officials noted no concrete investment plan currently exists for alleys or sidewalks, increasing the likelihood that an infusion of funds would make a substantial impact. Planned improvements to public safety facilities include creating a permanent building for the Fire Training Center, repairing roofs, and sprinkler and HVAC upgrades. Increased funding would also, notably, allow for the installation of hearing loops for the hearing impaired at all libraries, an improvement only available at select library locations throughout the city. Measure A would increase the Long Beach sales tax from nine to ten percent for six years and then “sunset” to 9.5 percent for the remaining four years of the ten-year increase. The less controversial Measure B would create a new rainy day fund that would stash one percent of all new revenue to the general fund to address the city’s future infrastructure needs. Officials said they hope the infrastructure plans will provide reassurance to the public, in light of concerns expressed by a vocal group denouncing Measure A. A group known as “Long Beach Rebellion” has launched a website denouncing Measure A, and distributed anti-Measure A leaflets to businesses—some in the form of a literal blank check made out to the mayor. It launched a recent campaign that is calling on all members of the council to commit one year’s salary to charity if the measure passes and the funds don’t go to their proposed purposes. The mayor and DPW Interim director Craig Beck elaborated upon the mayor’s comments from last week that highlighted the safeguards in place for proper spending of the city’s money, safeguards also intended to assuage citizen concerns. In an interview last week, Garcia pointed out that while other municipalities around Long Beach, including its own school districts have passed general revenue measures in recent history, the city has gone over 35 years without passing one. He said the Measure A dollar figure represents about half that of the Long Beach City College Bond Measure, which will also be on ballots this year. His message to voters: it’s time.